May 8th, 2011 by KTU | Filed under 5. 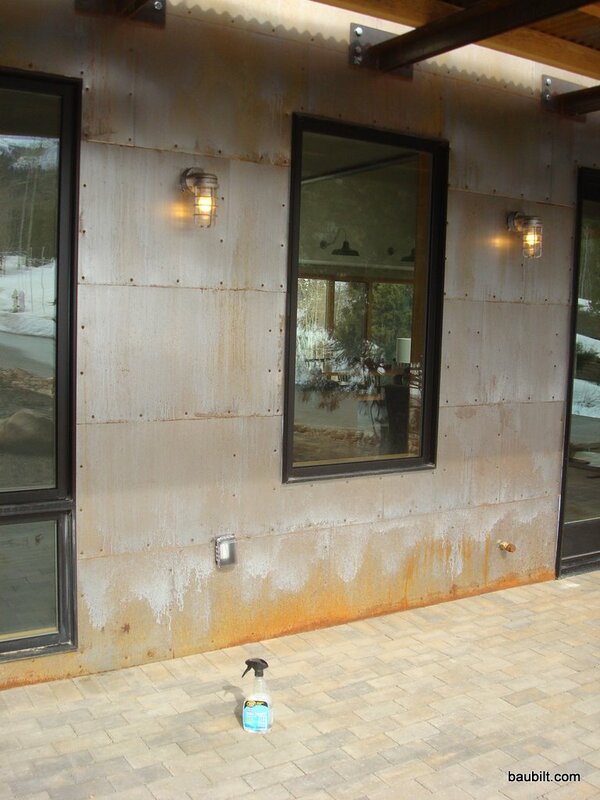 Exterior Materials and Finishes, Park City Mountain Modern. I mixed 1/4 muriatic acid (standard stuff at Home Depot) with 3/4 tap water in a spray bottle. (Be very careful. Muriatic acid is, well, acid. It really does burn your skin and can destroy your eyes, too. Gloves and safety glasses/goggles are essential.) I simply misted the entire wall surface with the spray bottle. In 24 hours, as long as the temperature is above about 50F, the entire surface will be very rusted. You can see where you have missed spots and just hit those again. I’ll be curious to see how the accelerated oxidation compares in color to that of the naturally oxidized surface. You can already see that where water has bounced onto the wall, the surface is more orange. Anyway, I’m pretty happy with the results. I would be curious to know if an even milder acid would work (e.g., white vinegar). I bet it would, especially if the temperatures were a bit higher. Same wall 24 hours later after application of diluted muriatic acid. The fireplace bump-out on the right had been done previously and you can see orange color near bottom where water has splashed. where can i get this steel siding ? This is just 20 gauge cold-rolled steel. I think our panels are 2′ x 3′. Any steel supplier should have a coil of 20 gauge material and can shear up whatever you’d like. This should be very inexpensive. In my case, my roofer got it from his supplier and installed it. We used McFeely washer-head plain-finish steel screws with a 2″ lap on the sides and a 3″ lap on the top and bottom. I’m so glad I found this blog. I’m loving it. A great mix of modern and traditional/industrial elements. I’m in the building process right now not too far from your house – actually about 50 miles north (Mountain Green, Utah). Though my construction budget is only about half what you had to work with, I’m finding a lot of great tips here. I just finished laying my own radiant tubing in the basement (concrete was poured today) and think I’ll do it on the main floor as well (it’s a rambler). I’m going for a modern farm/industrial vibe. Traditional shape with some industrial details. I love this steel siding. Thanks for all your work documenting the process. Your house is fantastic. I was going to do the same thing to my house… was wondering if they screwed the steel straight to the wood substrate or planking? I want to put just a 1/2 inch of pink foam down first to knock out the thermal bridging… wonder how well that will work with the steel. Or did they have furring strips somehow? I think a foam layer is a good idea. We did not add any foam. I didn’t want to have to trim out the windows to accommodate that foam, which would have been necessary where we used the barnwood siding. However, if you use only steel siding, you could add a foam layer and the windows would not need to be bumped out to handle the extra thickness. I think this would work just fine by just using a longer screw. I’d probably use the 1/2″ polyiso foam which would give you maximum r-value. Thanks. Great looking building… good job. Do you ever think about stopping the rust process to achieve a permanence with a certain color? Thanks for all the inspiration and information. Now that this siding has been up for a couple of years have you seen any issues due to expansion/contraction? i.e. loose screws or warped panels? Thanks for your time. It’s now been three years since we installed the steel siding. Remarkably the panels are still not fully oxidized. Utah is really dry! They look pretty good, though, and they’ll get there. In retrospect, I would have used a milder acid where I accelerated the oxidization, possibly some diluted vinegar. Where I used muriatic acid, the panels are very dark, almost black. There is definitely some buckling/oil canning when the sun is intense. Somethings you’ll hear a clang or pop as the panels buckles. But, that doesn’t seem to influence performance or appearance in the long run. It doesn’t bother me. Overall, I’d definitely use these panels again, pretty much just as I installed them. Thanks you for your response and all the time you have invested in sharing your experience. Ordering steel tomorrow. 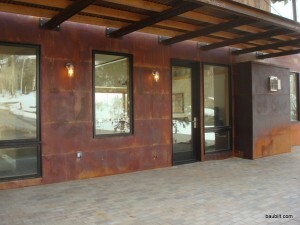 I would like to use corten panels as a veneer behind a wood burning stove. As a interior application would you still recommend the diluted vinegar solution? Sounds like thermal expansion could become an issue. Any thoughts? I think this depends on the climate. In Florida you could probably get them to oxidize without anything, but in Arizona, you’d need muriatic acid. I’d probably try vinegar first, and if needed apply muriatic acid. Incidentally, I used mild steel panels on my fireplace wall with no treatment and the mill finish has remained as new for three years (in very dry Utah). Yes, I agree this may be an issue. On my fireplace wall, I applied steel panels over black landscape fabric with a small gap between panels (~1/4″). I also used heavy (10 gauge) panels. That’s a thickness of just over 1/8 inch. I left the mounting holes a bit oversized and used a washer head screw from McFeely’s. That wall gets quite warm and we have not had any buckling. I believe the panels are free to move a bit relative to the screws. We are interested in doing this to our garage doors. Did you cover your existing doors with steel panels? Any tips? Your house looks great! 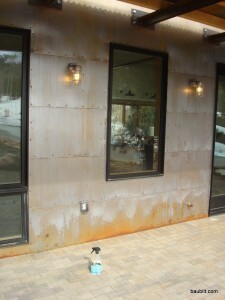 I applied these panels over a conventional “raised panel” steel door. We applied the steel to the door sections before installation. Then, the garage door guys balanced the springs and hung the door. The only thing I would do differently next time is to paint the edges of the door sections brown. There is a little bit of the original white finish that shows when the door opens or closes. If you painted the edges brown first, you wouldn’t have this issue. I can recommend here is a non-corrosive oxidant especially for corten steel which allows a homogeneous rusting within 3-4 hours and you can seal it with some special coatings even the grate surface in gloss or matt for IN or OUTDOOR. Because I deal with a lot of corten steel for facades and horticulture is the Oxidtaions & Coating System from Germany a real help. Installing panels should incorporate expansion and contraction, whether wood, metal or other sheet material. One fastener can be solid but any others should be flexible. Slots or overlarge holes can work for panels in shingle patterns like Karl’s wall, but the fasteners should have heads or washers that are larger than the holes. They should NOT be fastened tight or should have flexible washers such as found on metal roofing screws. You have inspired me to think of new siding on my place.